There are both gas and electrically powered units in our commercial smokers product guide. Some are mounted on trailers but if you're looking to purchase for a mobile catering business then take a look at our guide to trailer mounted smokers too. The capability to smoke a large amount of product at one time. Consistency and reproducibility. So that you get great results every time. The units discussed in our commercial smokers product guide clearly meet these standards and then some. Based at their factory in Alamo, Tennessee the company is American, Southern and well…proud of what it does. And that is building very fine electric and gas commercial smokers. All of which arrive on your doorstep fully assembled and stamped with UL, ULC, & NSF approvals. Southern Pride claim that they have a model to suit any commercial situation so to start out I am looking at the SC-200-SM and DH-65 electric versions. For the technical minded Southern Pride operate a ‘Vortex Convection air system’ which means temperature uniformity and thus even cooking. 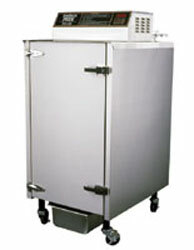 The beauty of this system is that you get a reduced cooking time that by default reduces shrinkage and retains moisture. This means that you can also cook at lower temperatures (as low as 150 degrees) and for full versatility if you want to cold smoke then simply leave the main element off. There aren't many commercial smokers out there that allow you to cold smoke as well as hot so that's got to be a plus. Another nice touch is that should there by any chance be ‘power or component failure’ with your Southern Pride Smoker, then ‘the unique wood burning feature of this equipment allows for the cooking process to continue’. Both the SC-200-SM and DH65 are easy to operate and clean and are of the ‘cabinet’ design; have a digital controller that is capable of handling up to 40 programs for additional cooking needs; are of a compact ‘cabinet’ size and easily moved; they carry a 1 year limited warranty. Gas or electric, what stands Southern Pride commercial smokers out from the crowd is that their ovens use fireplace size logs to obtain their special flavor, aroma, color and texture. The company claims that with their unique ovens, there's no need for any professional cooking ability and you don’t need to ‘micro-manage’ any of their units. I love the marketing angle that from a pure economics point of view they also highlight the fact that you can actually save money as there is no need to spend time on training employees to cook the food for you. 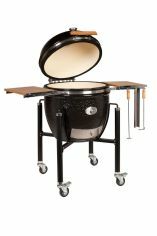 I quote: ‘Simply load the product, set the thermostat, and forget about it until your taste-tempting barbecue is ready’. Is UL, ULC, & UL EPH approved. Has a pre-stressed chain drive rotisserie system with ‘overload protection’, is self- basting thereby reduces shrinkage and retains moisture. 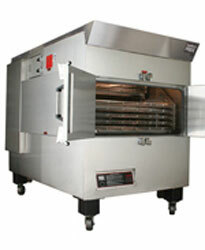 In conjunction with the convection system, the rotisserie also eliminates the need to ‘turn the food’ while it cooks. There are three electric commercial smokers in the Traeger range using exactly the same technology developed successfully in the range of domestic smokers. Because of the size however and the need for portability they are all on wheels and the larger two are conveniently housed in a trailer. Powered by electricity, a microprocessor control board regulates the burn time of the wood pellets so determining whether it’s a smoker or a grill. There’s three settings, high, medium and smoke. Popular with delis and small restaurants this grill has 13 square feet of cooking surface, it can cater for parties of up to 150. Features include a stainless steel hopper lid that doubles as a work area, a stainless warming area on top, heavy duty legs and industrial-grade, locking casters. Effectively two SMK150’s mounted on a trailer that allows you to set up in the middle of the crowd. It therefore has twice the capacity of the SMK150 and will serve up meals for 300 people. One additional feature is a small cargo box on the front of the tow bar. Get maximum capacity with minimum labour. This unit has 50 square feet of cooking space and so houses up to 224 chicken quarters. It’s ideal for serving large crowds simultaneously and Traeger claim that you can even do a whole hog in it! Traeger commercial smokers can pretty much be set off and left alone although one of our readers has this piece of advice in his Traeger Grill Review about the pellet feed.